If it’s too early to drink, you could always bake this. I am no gardener but my little Cheergerm heart swelled like a helium balloon at the bumper crop of lemons my mini-citrus tree birthed this year. Each lemon is picked and used with tender loving care and the deep appreciation that using homegrown produce brings. 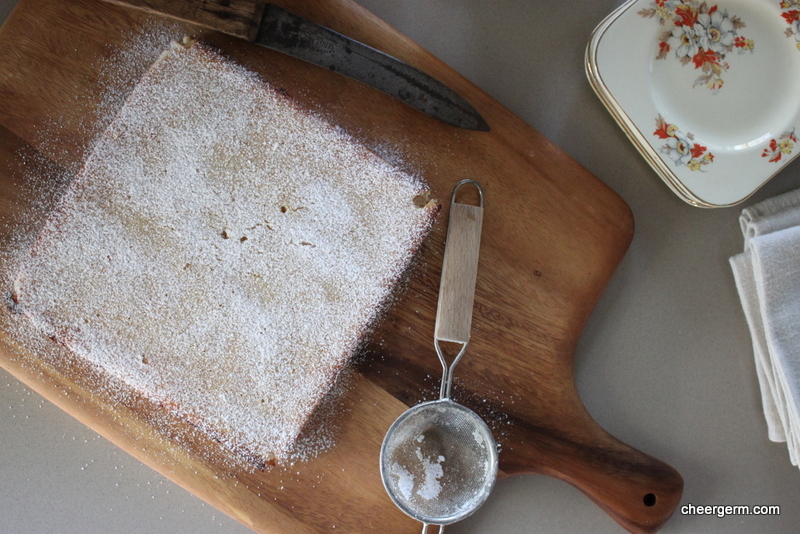 This is a tangy, delicate and deeply delicious treat. Preheat the oven to 170C fan-forced or 180C conventional. For the biscuit base: Beat the butter and icing sugar in a bowl with an electric beater or in your stand mixture, until smooth. Stir in the 150g of gluten free plain flour. Press this mixture evenly over the base of the prepared pan and bake for approximately 15 minutes or until it has browned slightly. Remove from the oven. 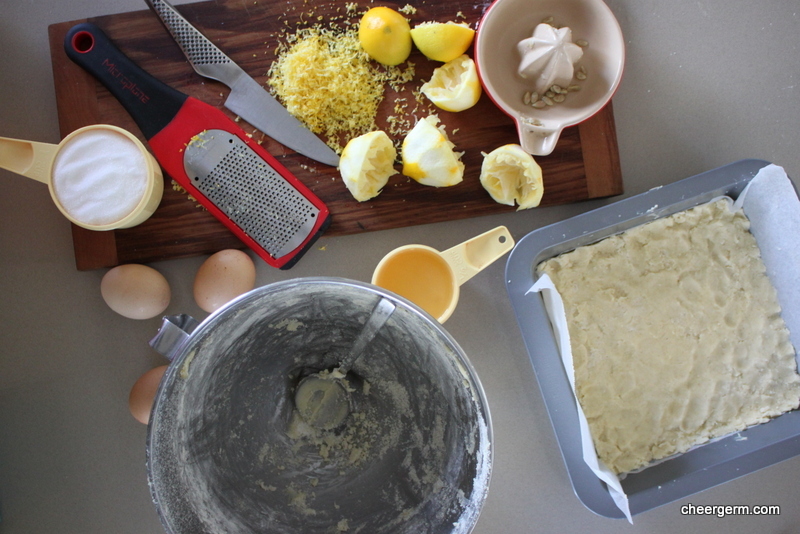 For the lemon topping: Place the eggs, caster sugar, remaining flour, lemon zest and juice into a bowl and whisk until well combined. 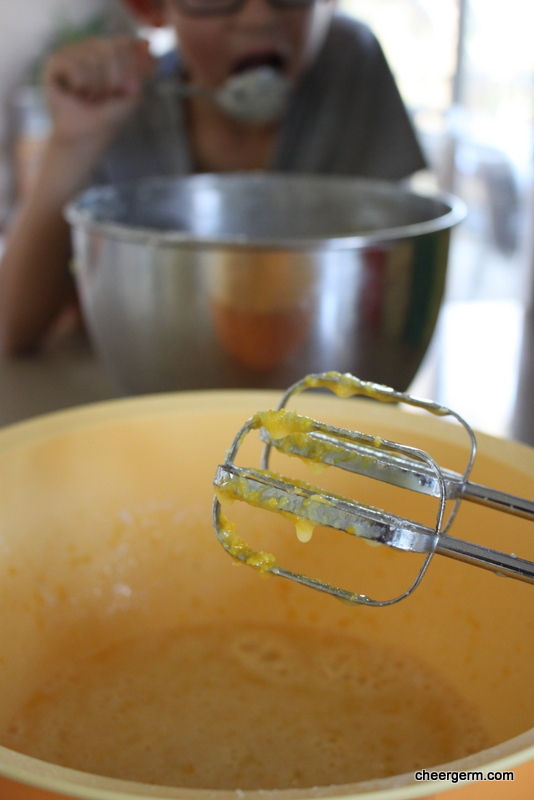 Pour this mixture over the prepared base and bake a further 20 minutes or until it is just firm. 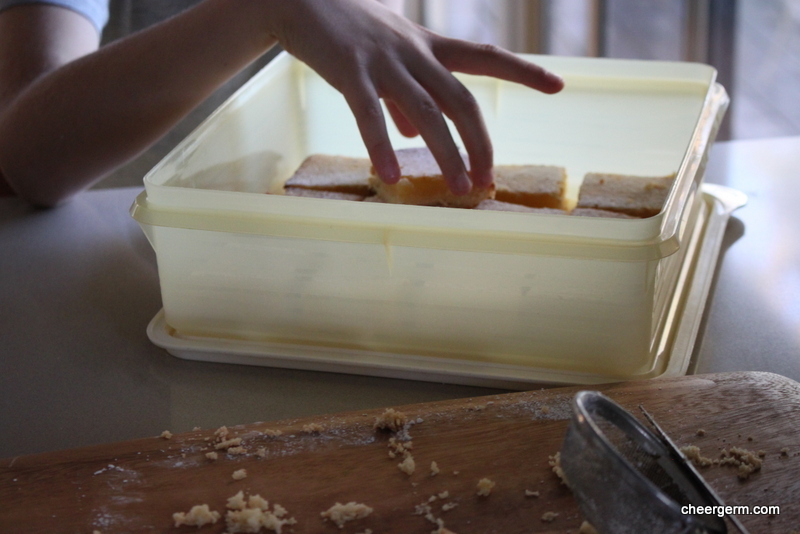 Remove from the oven, place on a wire rack and let the slice cool completely in the tin. 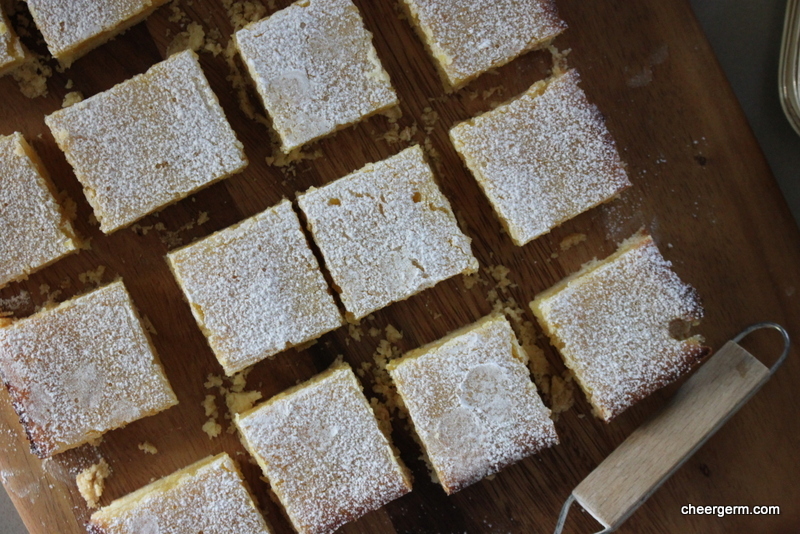 Slice into pieces (I cut it into 16 square pieces) and dust with extra icing sugar for decoration. A Cheergerm adaptation of a recipe from the ninemsn website. Link to original recipe follows after photos. 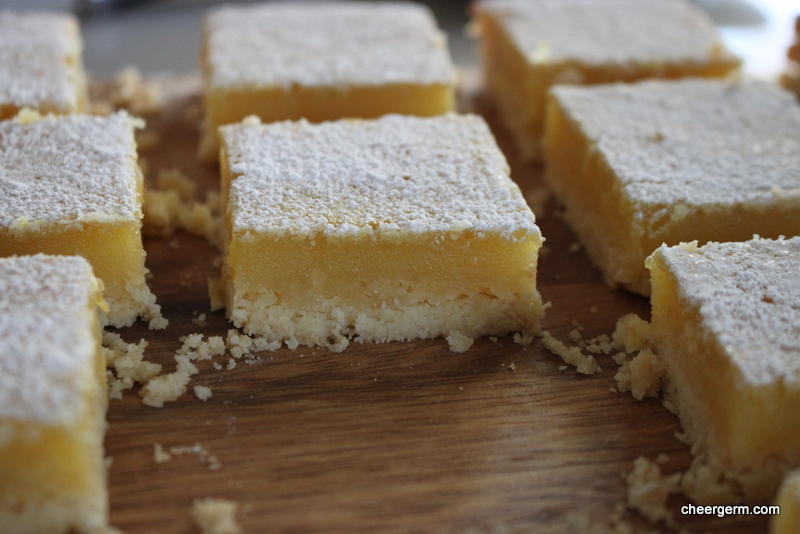 This entry was posted in Uncategorized and tagged baking, cheergerm, citrus, Cooking, food, gluten free, gluten free lemon bars, gluten free lemon slice, lemon, lemon slice, recipes. Bookmark the permalink. Life gives me more limes than lemons because my lime tree is bigger. But I just happen to have a load of lemons to hand, and my mouth started watering at the sound of all that tart lemony deliciousness. I feel a slice coming on… Probably tomorrow. Would love a lime tree! Lovely. It’s a goodie Kate. Hope you are mending well. Mmmm, lemons! Our lemon tree is not playing along this year but thankfully we raided MIL’s tree and have squillions of lemons. Your slice looks so delish and moist. Thanks Mrs H, it’s a nice one indeed. Thank goodness for your Ma-in-law! It’s never too early to drink a margarita, Cheery. What could you be thinking? Perhaps a compromise – a sip while you are prepping? Love it Minstrel, what is wrong with me?! So will be going to Margarita Land next time. 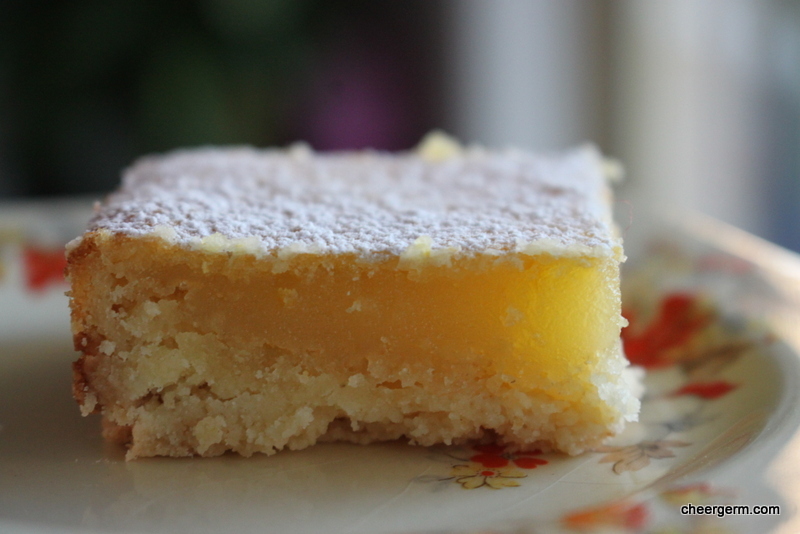 So good…I could do with a slice of these lemon bars right now!! Thanks so much, would send you one if I could! Thanks CJ, it was quite the tasty slice. Me too, hard to beat a citrus tang hey? I couldn’t believe it myself, they just kept growing! They smell and feel pretty darned nice LM. If only I cared as much about the rest of the garden, oh well, that’s the Yaks domain. Lisa, your photography is award-worthy. Love the shot with one of your boys in the background enjoying the yummy spoon. 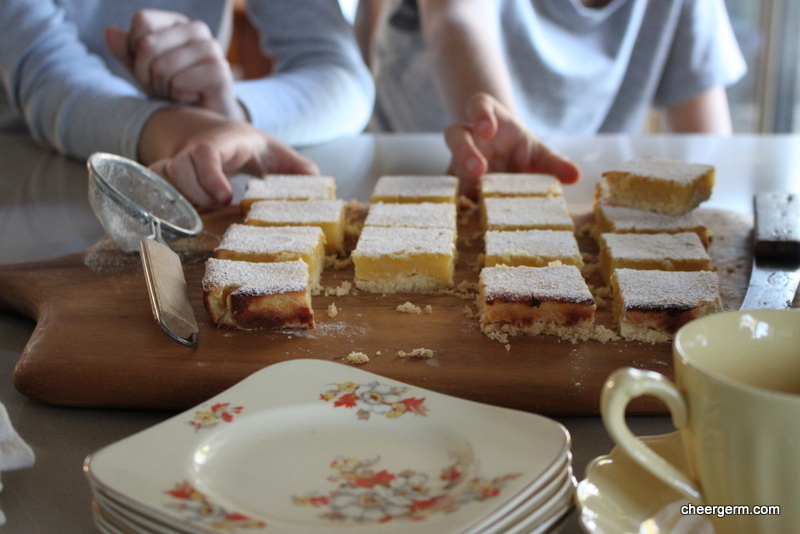 The joy of cooking is so evident in this post, from the harvesting of your home-grown lemons to the final product that makes everyone in your home happy. Beautiful. And, btw, I love anything lemon! Thanks Sue, what a lovely thing to say. Sometimes the light is right and it’s just about trying to capture something happy that is happening. Lemon is just the best hey? Lovely slice. And beautiful photos of the boys’ hands reaching in to eat the. and other lovely lemony pics. I bet they didn’t ;ast long. Thanks Francesca. Best fun kind of photos to take. It is a delicious one and never lasts long. 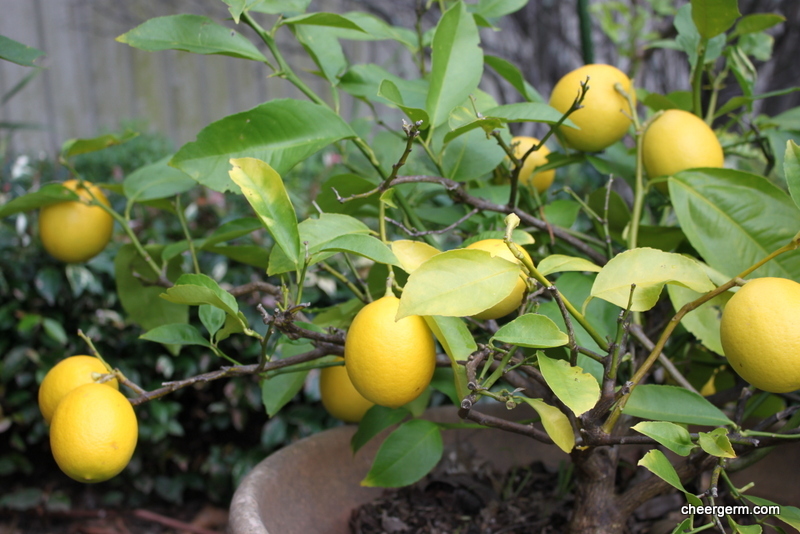 My ‘lemon glut’ (ha, not compared to some I am sure), means a repeat soon. Man oh man could I use one of these right now! Sent – in the ‘beam me up Scotty machine’ your way Cake. Beautiful pics! I don’t care about gluten, but I’d still make this! So nice to have a lemon tree! I do envy you the lemon tree, which I assume would not grow around here. 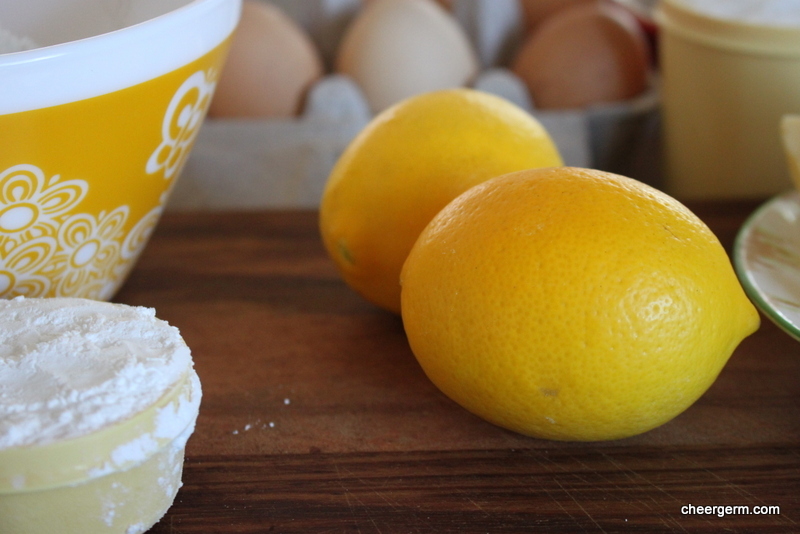 Your lemons are picture perfect – and that slice looks to die for! Off I go to market tomorrow to find me some organic ones. I am quite shocked that I have managed not to kill this poor tree but I could get used to all this ‘citrus excess’. (Ie roughly amounting to approximately 12 lemons…) Good luck finding some organic market ones Mel. Are you still coming this way at some point? Thanks, it’s a tasty treat, yes indeedy! Thanks heaps, it’s a goodie! 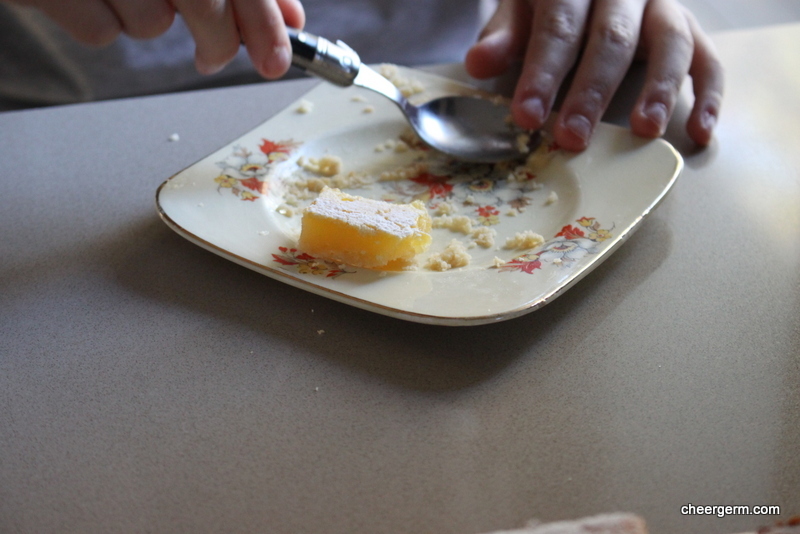 Have you tried making cheesecake using gluten free biscuits in the base? It works pretty well.